Introduction: The Sonora doesn't garner the same amount of attention as its more refined siblings, anglers are always quick to bestow praise to the Stradic and Sustain, often forgetting that there are actually 15 other Shimano reels existing beneath the Stradic. The Sonora is one of the recently redesigned "value" spinning reels, and is the most affordable Shimano spinning reel to come loaded with advanced A-RB bearings. Impressions: What is the definition of a "value" reel? In the past we have categorized a value reel as any reel below the sub 40 dollar price point. Anglers used to have to sacrifice features like anti-reverse and settled for a spare graphite spool when purchasing value reels but those times are gone, and now the only thing anglers are sacrificing is refinement, as most reels in this price range come with the complete range of basic features. In terms of lineup the Sonora is positioned in between the Sienna (29.99) and the Sedona (49.99). The Sonora makes use of A-RB bearings while the Sienna does not, and the Sedona is the lowest reel in the Shimano lineup to be designed with the S-Concept philosophy. The Sonora looks and feels like an aluminum reel, but the reality is that the skeleton of this reel is formed completely out of graphite. The frame, rotor, and sideplate may all be graphite but its really quite hard to tell. The graphite is finished so nicely that it not only looks like painted aluminum, but feels like a metal alloy as well. Graphite reels typically weigh more, as they need to be well reinforced, but the Sonora narrows this gap to the highest degree. The graphite framed Sonora 2500 Weighs 9.8oz while the aluminum framed Shimano Sahara 2500 weighs 9.7oz. 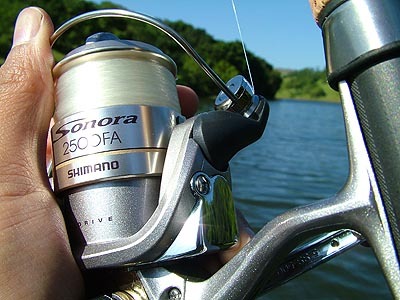 Overall the Sonora is quite an attractive reel, with very little plastic showing, save the bail arm. Field Tests: Most anglers that are interested in a value reel are looking for a multi-talented reel that can excel in a variety of applications. This lead us to pick the 2500 size Sonora, as the 1500 is better suited towards finesse applications, and the 4000 size is geared for larger game than bass. We paired the Sonora with a Shimano Convergence rod and spooled the Sonora up with easy casting Trilene XL. Our tests were conducted on a number of local lakes prior to the seasonal spawn. Casting: One of the hardest categories to distinguish reel performance is in the casting department. I remember the first time I bought a car that my father considered to be overly pricey, he questioned why I bought the vehicle, and cited that all cars...regardless of price will get you from point A to B just as well. The same statement can be applied to premium versus value reels. Do value reels cast lures from point A to B as well as reels costing twice as much....generally the answer is yes. While casting certainly is affected by spool diameter, spool lip coating, and line lay, the majority of your casting issues will come from rod design and the particular lure type you are using. We found that our Stradic did cast a bit smoother, but in terms of total distance we were talking a difference of inches not feet. With a flip of the bail the Sonora proved to be a very respectable caster, able to project both our test plugs and a wide range of lures effectively. Retrieving: The Sonora is half the price of the Symetre, but in terms of smoothness and quality of retrieve it definitely offers much more than half the performance. In fact when compared to a Sedona the Sonora felt almost identical. The Sonora makes use of only two ball bearings, and one line roller bearing. 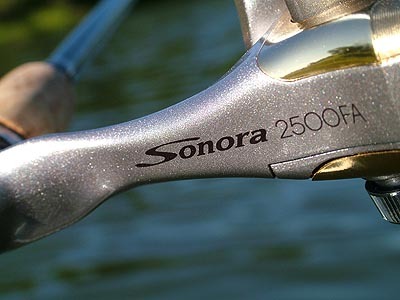 For a three bearing reel the Sonora feels surprisingly smooth, there is some resistance in the raw gearing, but that is to be expected as this is the type of refinement that sets the Sonora apart from its more costly siblings. Shimano's "dyna-balance" design uses counterbalancing techniques within the graphite rotor to eliminate wobble. Shimano's Power Roller II helps reduce twist during retrieves and is actually slightly tapered on the support to help wind line onto the roller quicker and more evenly. When setting the hook we would pull back on the handle aggressively and were very pleased with the complete lack of backplay. Shimano has included their Super Stopper II one way roller bearing in the Sonora, the same very system used in the flagship Stella. 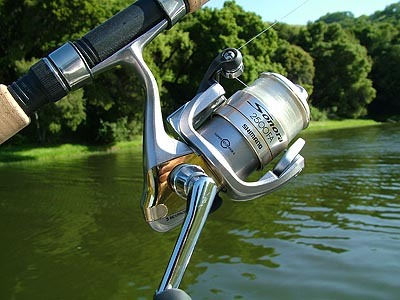 The Sonora isn't the fastest reel out there, but with a brisk retrieve it can be used for burning cranks and spinners. The reel is however quite powerful, and with a 5.2:1 gear ratio we were able to haul full-sized bucketmouths without breaking a sweat. The Drag: Spinning reels have the advantage over small baitcasters when it comes to drags. Sheer surface area allows manufacturers to cram plenty of disks into the spool or get creative with innovative materials. In our lab the Sonora fully dialed in was able to deliver 11.3lbs of counter pressure. Compare that to the Stradic 2500 which is capable of 15.2lbs of pressure on the same test machine. Once again, half the price...but plenty more than half the performance. The Sonora's drag dealt with all of the fish we caught during our test. While the drag delivers plenty of fish fighting pressure we did note that drag performance was not as smooth as some of the more expensive reels. 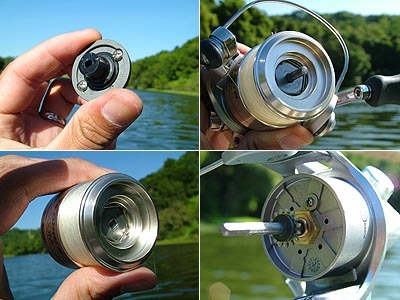 Shimano should be commended for including a cold forged aluminum spool, complete with an identical drag system. 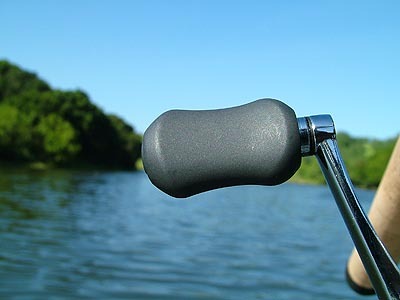 Durability & Ergonomics: Also gone from all but the very low end Shimano value reels are the hard plastic barrel knobs. The new handle is ergonomic, comfortable to the touch, and easier to grasp even when wet. Both the 1500 and 2500 sizes come with the ergonomic knob while the Sonora 4000 comes with a larger paddle for more power. Ergonomically the reel is well laid out, with the anti-reverse switch conveniently located on the underside of the reel, making it easy to flip the switch for back reeling in one motion as you reach for the bail. The reel's main arm is wider than most Shimano reels, this is because the graphite needs to be reinforced. Other all aluminum reels can make use of a skinny sculpted arm to reduce weight. 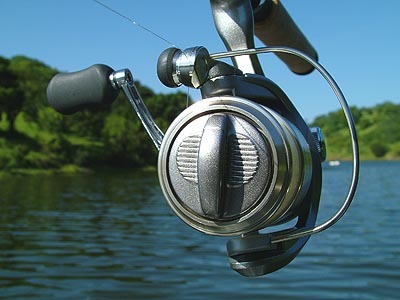 The reel is well reinforced, and while it doesn't feel as solid as an aluminum reel, it didn't show any signs of flex while fighting fish either. Durability-wise the Sonora is well built and thanks to the implementation of A-RB bearings it should have no problem supplying years of service when used under normal conditions. Price: At 39.99 the Sonora is right on the upper echelon of the value category. But 39.99 isn't a whole lot of money to be paying for a brand name spinning reel of this caliber, were basically talking two premium lures here. The reel fishes like a 60 dollar reel, and to our delight the reel now looks like a much more expensive reel as well. The reel's clean profile can easily be mistaken for the more expensive Sedona. The performance gap is narrowing...and the price remains unchanged. Shimano has done an excellent job not only bringing quality components like A-RB down the lineup, but also redesigning the value reels like the Sonora to be more polished. Conclusion: Reels like the Sonora are really making us rethink the way we categorize a value reel, perhaps we need to think about lowering the value price point down to 29.99 to keep up with the quality of the current generation of reels. While the Sonora may not have the refinement of the Symetre or the Stradic, this surprisingly cultured piece of equipment really is a very good reel, and a downright great value for less than 40 dollars. 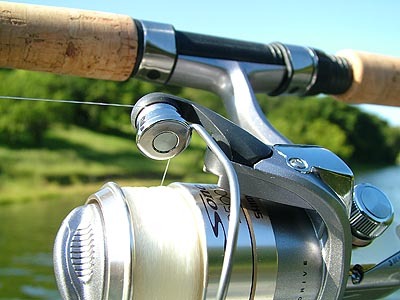 Shimano has a robust spinning reel offering, designing and building reels at every price point (many of which are priced up in just ten dollar increments in fact). There are many anglers that, like my father, don't need all the bells and whistles offered in premium and enthusiast tackle, and for those anglers that are looking for a great reel to simply get their lure from point A to B and back, hopefully with a fish in tow, the Sonora is the perfect choice.